Barcelona, 4th June 2008 – ADELTE has recently been awarded a contract by Harwich International Port to design, manufacture and deliver a moveable and modern Passenger Boarding Bridge (PBB) of the SEDNA range. This PBB will be delivered by March 2009 at the cruise terminal building in the Port of Harwich, United Kingdom. Harwich International Port (part of Hutchison Ports UK Ltd.) awarded ADELTE the contract to design and deliver the PBB installation after publicly advertising for bids earlier this year. The purpose of the PBB is to provide passenger access between the cruise terminal building and the continuously increasing number of cruise vessels calling on Harwich in order to allow embarkation and disembarkation in a secure and safe manner, unaffected by weather conditions or tidal ranges. The purpose-built cruise terminal, which was inaugurated in 1996, has excellent passenger and luggage handling facilities. Harwich International Port is dedicated to deliver an unbeatable service matching the requirements of modern large cruise ships. Harwich is the most northerly of the major cruise Ports on the UK’s east coast, and is perfectly placed for Scandinavian and Baltic cruises, as well as round-Britain and other European destinations. The strength of this location is recognised by major cruise lines and Harwich International Port is expecting 70 cruise calls in 2008. In the design parameters for the PBB set out by Harwich International Port, the capability to move along the whole quay is a crucial factor. Another very important feature is the adaptability of the PBB to connect with the entrance of the terminal and the various entrances of the cruise ships. The cabin of the PBB is equipped with a uniquely integrated hydraulic, telescopic, docking ramp that, when attached to the side of a cruise ship automatically follows the vessel’s movements and will immediately undock in the event of an emergency. The clearance under the PBB allows continuous truck, equipment and supplies traffic on the quayside. ADELTE’s PBB can serve any cruise ship calling on the port and is compliant with international safety and security standards. With a total length of 160 metres, this PBB installation will become the world’s largest enclosed passenger access system ever built for a cruise terminal. The safety features of the structure are paramount for the installation. The drawbridge cabin incorporates a series of state-of the-art technological devices to alert to any ship movement that shouldn’t be occurring, and provides a number of alarms at different stages to make operators aware that things aren’t moving when they should be. 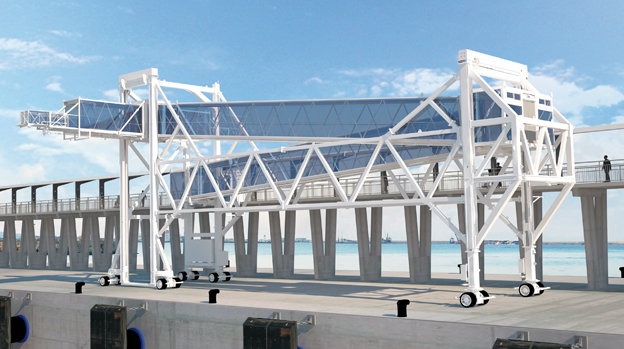 The bridge will also incorporate an auto-retractable cabin pod in case the ship is moving too far away from the berth. Aside from that, general fire safety will be incorporated throughout the rest of the installation. ”Equally to the earlier successfully installed THALASSA PBB for the Ferry Terminal at Harwich, this particular SEDNA design permits great flexibility”, according to Jordi Floreta, Managing Director Ports Division at ADELTE. “The part of the PBB which connects with the vessels is a moveable structure, it allows longitudinal movements along the berthing zone of 25 metres, an elevating stroke of 10 metres and a telescopic movement of the drawbridge cabin of up to 6.5 metres. The connection of the moveable PBB part with the multi-door enclosed tunnel sections is an important feature as it allows for great operational flexibility”.